In Orion Pax Part 2, when Optimus looks himself up on the Decepticon Database, a fake image of Optimus shows up. 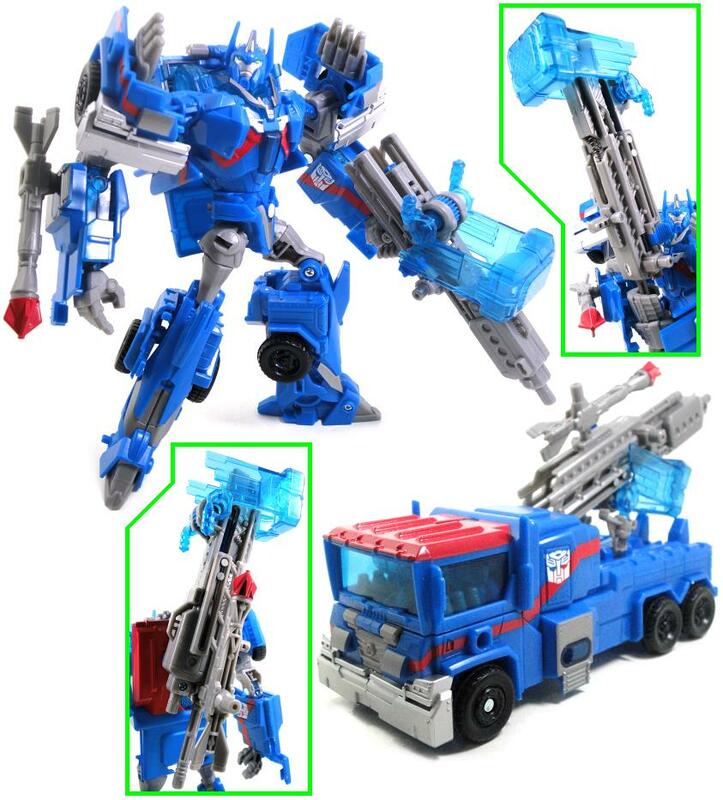 This image looks very, VERY similar to a cybertronian version of the upcoming Ultra Magnus toy. 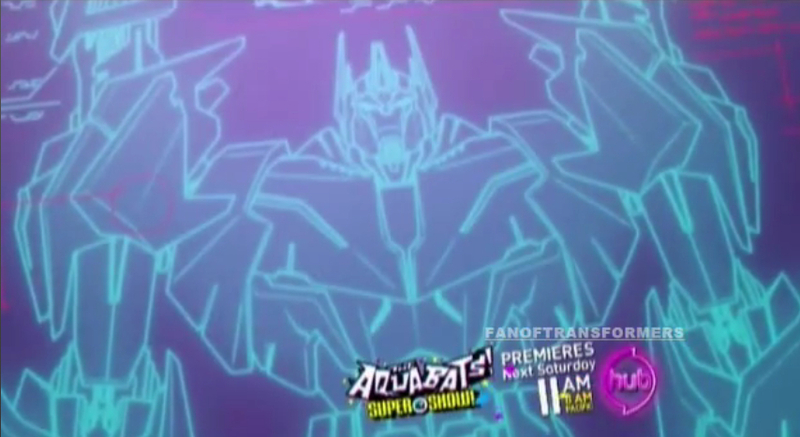 Could this be a sneak peak of Ultra Magnus? It's still meant to be Optimus since it was put under an "Optimus Prime" profile. Only the head looks similar, as the body looks different (and this show's been too cheap to redesign Cybertronian bodies to look distinct from their Earth bodies, so it's probably a made-up body design). Either way, this supposed Easter egg needs to be explained. Sabrblade wrote: It's still meant to be Optimus since it was put under an "Optimus Prime" profile. Sabrblade wrote: Only the head looks similar, as the body looks different (and this show's been too cheap to redesign Cybertronian bodies to look distinct from their Earth bodies, so it's probably a made-up body design). Besides, if you're going to make up a design, why not have it be a design you'll use later in the show? Yet, Orion recognized it as himself (How can I be Optimus Prime?"). I just said that this show never makes Cybertronian bodies that look different from Earth bodies, so it can't be one. Wing Saber wrote: Besides, if you're going to make up a design, why not have it be a design you'll use later in the show? It's a crude wireframe rendition, not a complete CG render. Actually the cybertron version of Optimus is shown in the flashback of Optimus and Megatron's origin in the last episode of season 1. Orion only recognized it as himself after it was descrambled. The wireframe might be based on concept art since they have used it in the show before, like in the previously mentioned flashback. cyberwuss wrote: Actually the cybertron version of Optimus is shown in the flashback of Optimus and Megatron's origin in the last episode of season 1. That was hand-drawn. All other CG animated flashbacks just recycle the existing Earth mode bodies. Sabrblade wrote: I just said that this show never makes Cybertronian bodies that look different from Earth bodies, so it can't be one. The cybertronian version of Optimus is shown. Why not Magnus? That doesn't change the fact that it could be Ultra Magnus, since the wireframe on the screen could also and most likely is hand drawn. Also the hand drawn cybertronian Optimus was originally going to be turned into a CG form as mentioned on the commentary for that episode on the season 1 dvd, they just had too many deadlines to meet and didn't have time to finish it all the way. Just because the image appeared on a screen in the 3d cgi doesn't mean it isn't hand drawn either, since images can easily be imported to 3d as textures for the cg models. EDIT: also there are only about two other times that would matter for the point of using earth mode bodies: arcee + tailgate flashback when airachnid offs tailgate, and wheeljack in space trying to hunt dreadwing. We have seen Megatron a few other times in flashbacks, but considering he doesn't have an Earth alt mode he is probably still his cybertron robot mode as well.